Home > Tactics RPG > Fire Emblem Heroes is out on mobile! It's awesome! Fire Emblem Heroes is out on mobile! It's awesome! When Nintendo announced that it was producing a Fire Emblem game for mobile devices, I more-or-less guessed the form that it would take. Earlier in the year, gumi had localised Phantom of the Kill for mobile devices, so I knew the genre would work, and I guesses that the mobile Fire Emblem game would be similar in structure. As it turns out, I was right. Only, as good as Phantom of the Kill was, it’s nothing compared to Fire Emblem Heroes. Like Pokemon Duel, released last week, this is a game I see myself spending an awful lot of time with. It’s been a good couple of weeks for mobile gaming. The first thing to note about Fire Emblem Heroes is that it is a streamlined take on the handheld and console series that we’re used to from the franchise. 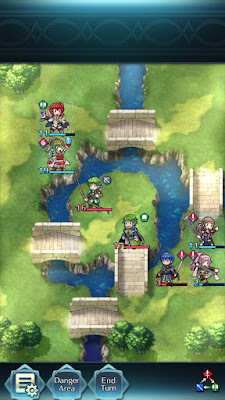 The console Fire Emblem titles feature battles in which dozens of characters duke it out over sprawling maps. Fire Emblem Heroes is more designed for on-the-go gameplay, and its short skirmishes feature up to four units on each side, moving around a map that fits onto a single screen. I’m a couple of dozen maps into the game now, and while it might expand out beyond this into larger maps, I’m not expecting it to. The point is clearly to have each battle over in a minute or two. The combat itself is vintage Fire Emblem. There’s the old weapons triangle, with swords beating axes, and axes beating spears, and spears beating swords. There’s ranged units, magic users, dragons, and healers and dancers (which provide buffs to friendly characters) that help to mix things up. At first the levels are simple matters of having stronger characters than the enemy, and overpowering them with brute force, but quickly enough the game develops the capacity to force players to be strategic, either through level design that makes it hard to move around, or enemy forces that have strong synergies that are difficult to overcome. I don’t think Fire Emblem fans will find the combat anything to complain about as a result. Where I think the complaints will come is in the narrative. 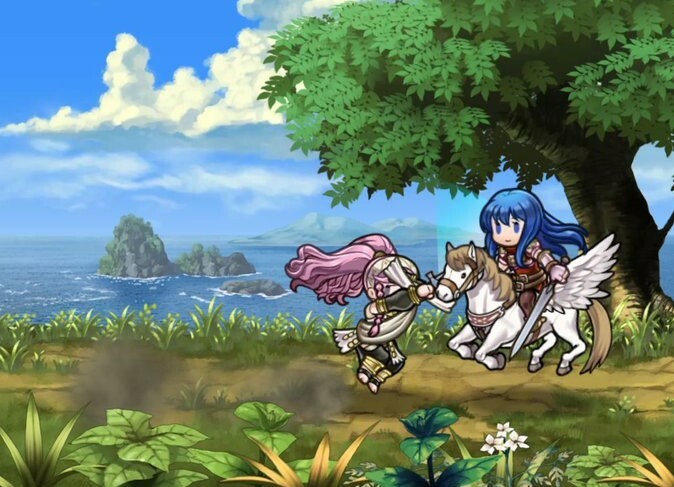 Fire Emblem is well known for being almost visual novel in approach, with long sequences of dialogue and character development between battles to give context to the action. Furthermore, later Fire Emblem games have dating game mechanics built in, allowing characters to form relationships with one another. All of this helps players become attached to their heroes, which is important, because the other stand-out feature of Fire Emblem is the fact that if a character dies on the battlefield, he or she is gone for good. If you care about the characters, as the plots try so hard to make you, you’ll be devastated when a valued companion leaves the earth. Fire Emblem Heroes doesn’t have this “permadeath” feature; a character that is defeated in combat comes back for the next battle. It also doesn’t have much of a plot, with characters making quick statements before getting back into battle with one another. What it does have to replace these features is fanservice. 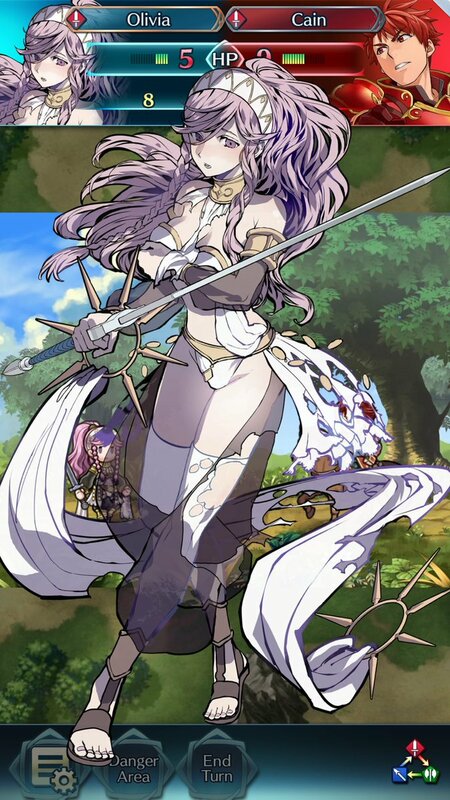 I’m not talking about “fanservice” as in the sense of a game like Senran Kagura, though in Fire Emblem Heroes a character that has taken enough damage will have their clothes ripped and when this happens to a character like, say, Lyn….. I digress. The fanservice in Fire Emblem Heroes is simply the fact that the game pulls together heroes from every Fire Emblem game, and lets you collect them and then form a dream party of your favourite heroes from across the series. For a series that is as character-driven as Fire Emblem, this is really, really exciting stuff, and there’s a strong “gotta collect-em-all” impulse when playing the game. The character art portraits are gorgeous, and the in-game sprites are so cute, it is a very enjoyable process unlocking each character one-by-one. The game’s monetisation model comes in unlocking characters faster, of course. You can spend a couple of “orbs” - the game’s premium currency - on a lottery to get new characters, with the rarer characters being much harder to get, of course. You earn some orbs through normal play, and it’s entirely possible to get through the game (and unlock a bunch of characters) this way. However, you can spend real money to get additional orbs, and unlock characters faster. Because I’ve been having so much fun with the game, I had absolutely no issue with spending $30 on additional orbs, especially since I then got lucky and unlocked Lyn. Now I have Lyn I don’t feel a great need to pay for additional orbs, and I’m quite happy to play with the rewards I get. As with any good free-to-play game there are a wealth of different play modes to keep you going, even when you take a break from the single player game. There’s no direct competitive mode, but given that, as a JRPG, character levels and powers are very important in the overall strength of the party, having a competitive multiplayer mode in there would have just encouraged people to spend way too much money. Related reading: For people looking for the traditional Fire Emblem experience, Fire Emblem Fates is a great place to go. Clark's full review. Given that 2017 is shaping up to be a big year for Fire Emblem, Fire Emblem Heroes gets things off to a good start. It’ll be seen as “Fire Emblem Lite”, but for those fans that have spent enough time with the series to fall in love with its characters and tactics combat, there isn’t anything better out there for mobile devices.